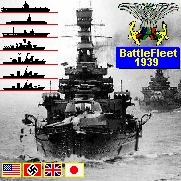 Battleship Game - WW2 Naval Strategy: the best choice among aircraft carrier games, submarine and battleship games. The B52 Stratofortress is an American military aircraft, a manned strategic bomber manufactured by Boeing. Often called a Cold War relic, B-52 still plays a major role in American Airforce operations. Air Combat Command's B-52 is a long-range, heavy bomber that can perform a variety of missions. The B52 bomber is capable of flying at high subsonic speeds at altitudes up to 50,000 feet (15 km). It can carry nuclear or precision guided conventional ordnance with worldwide precision navigation capability. In a conventional conflict, the B-52 can perform strategic attack, air interdiction, offensive counter-air and maritime operations. During Operation Desert Storm, B52 s delivered 40 percent of all the weapons dropped by coalition forces. It is highly effective when used for ocean surveillance, and can assist the U.S. Navy in anti-ship and mine-laying operations. 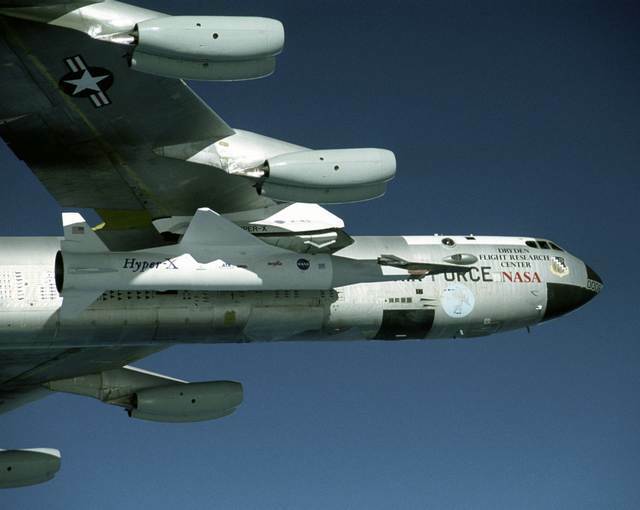 Two B-52s, in two hours, can monitor 140,000 square miles (364,000 square kilometers) of ocean surface. All B-52s are equipped with an electro-optical viewing system that uses platinum silicide forward-looking infrared and high resolution low-light-level television sensors to augment targeting, battle assessment, and flight safety, thus further improving its combat ability and low-level flight capability. B52 Pilots wear night vision goggles (NVGs) to enhance their vision during night operations. Night vision goggles provide greater safety during night operations by increasing the pilot's ability to visually clear terrain, avoid enemy radar and see other aircraft in a covert/lights-out environment. Starting in 1989, on-going modifications incorporates the Global Positioning System, heavy stores adapter beams for carrying 2,000 pound munitions, and a full array of advanced weapons currently under development. The use of aerial refueling gives the B52 a range limited only by crew endurance. It has an unrefueled combat range in excess of 8,800 miles (14,080 kilometers). The aircraft's flexibility was evident in Operation Desert Storm and again during Operation Allied Force. B-52s struck wide-area troop concentrations, fixed installations and bunkers, and decimated the morale of Iraq's Republican Guard. The Persian Gulf War involved the longest strike mission in the history of aerial warfare when B-52s took off from Barksdale AFB, Lousiana, launched conventional air launched cruise missiles and returned to Barksdale -- a 35-hour, non-stop combat mission. 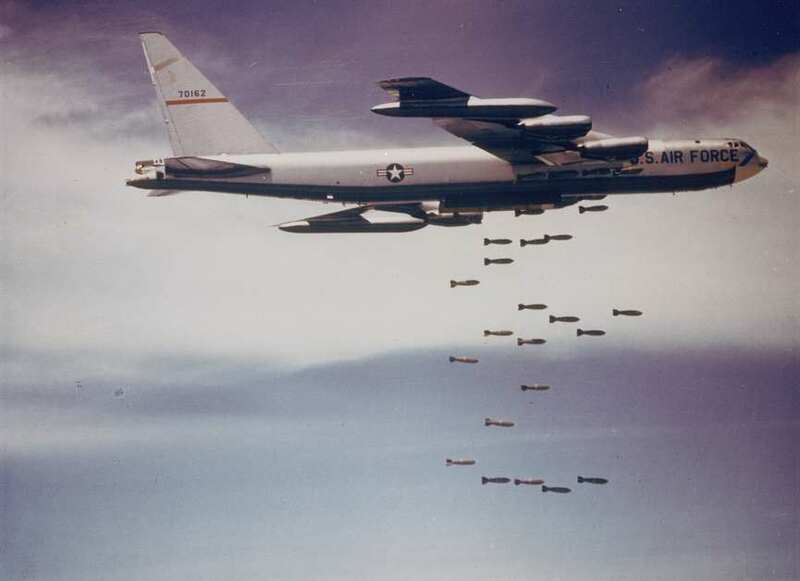 During Operation Allied Force, B-52s opened the conflict with conventional cruise missile attacks and then transitioned to delivering general purpose bombs and cluster bomb units on Serbian army positions and staging areas. For more than 40 years B-52 Stratofortresses have been the backbone of the manned strategic bomber force for the United States. 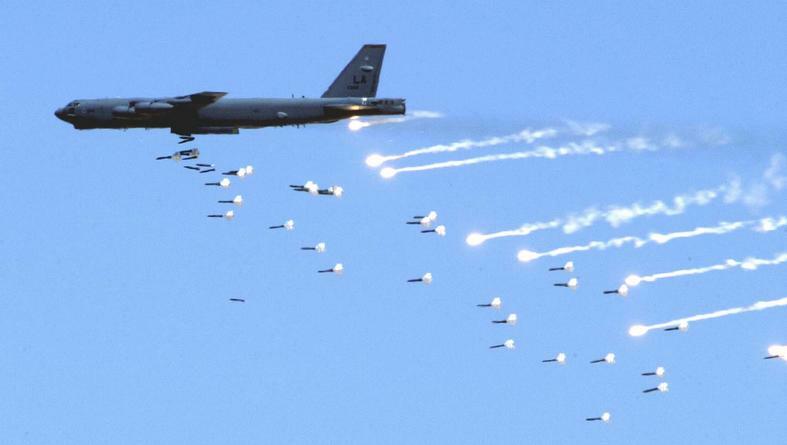 The B-52 is capable of dropping or launching the widest array of weapons in the U.S. inventory. This includes gravity bombs, cluster bombs, precision guided missiles and Joint Direct Attack Munitions. 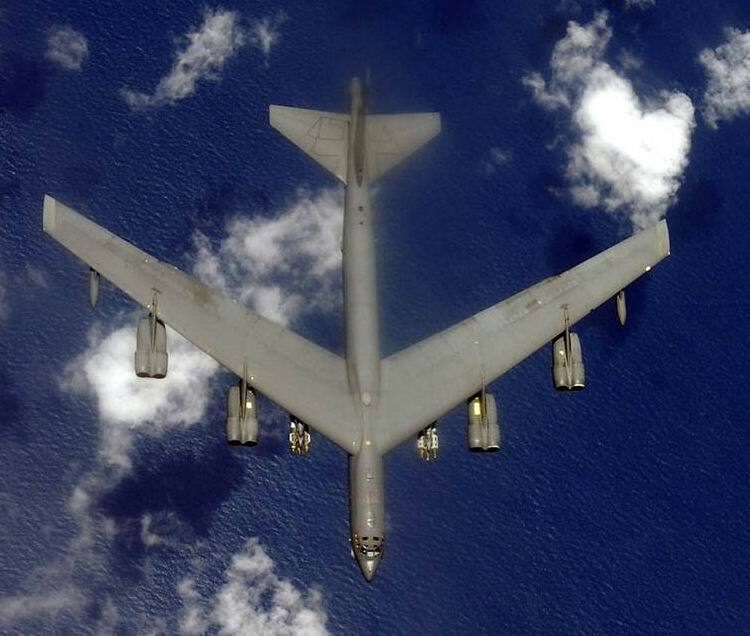 Updated with modern technology the B52 will be capable of delivering the full complement of joint developed weapons and will continue into the 21st century as an important element of the U.S.'s military capabilities. Current engineering analyses show the B-52's life span to extend beyond the year 2045. 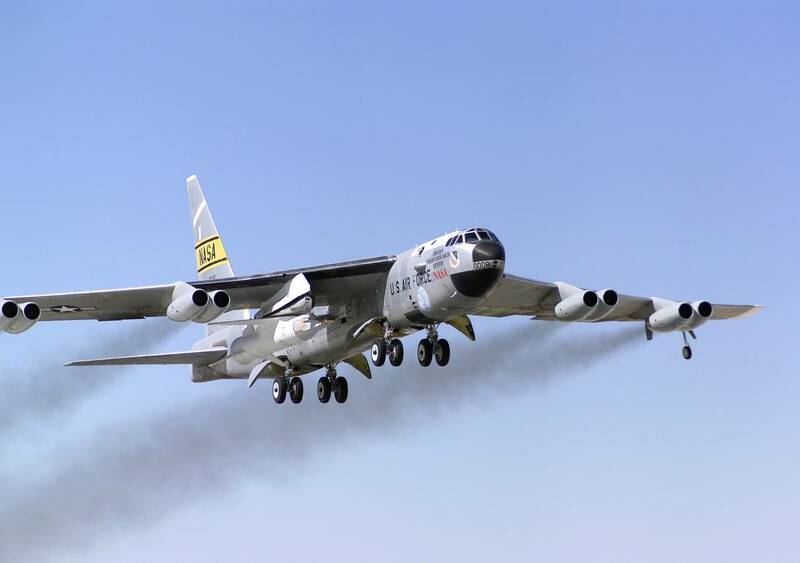 The B-52 A first flew in 1954, and the B model entered service in 1955. A total of 744 B52s were built with the last, a B-52 H, delivered in October 1962. Only the H model is still in the Air Force inventory and is assigned to Air Combat Command and the Air Force Reserves. The first of 102 B-52H's was delivered to Strategic Air Command in May 1961. The H model can carry up to 20 air launched cruise missiles. In addition, it can carry the conventional cruise missile that was launched in several contingencies during the 1990s, starting with Operation Desert Storm and culminating with Operation Allied Force. The B52 contributed to the U.S. success in Afganistan, providing the ability to loiter high over the battlefield and provide Close Air Support (CAS) through the use of precision guided munitions. The long range and endurance of the B52 provided a U.S. presence unmatched by any other combat aircraft. B-52's also played a key role in the second Gulf War in 2002-2003. During Operation Iraqi Freedom B52 Stratofortress bombers provided Close Air Support and bombing leading to the toppling of the Iraqi regime of Saddam Hussein. B52 Contractor: Boeing Military Airplane Co. Among its crew, the B-52 is affectionately known as the "BUFF", an acronym for "big ugly fat fucker" (or "big ugly fat fellow"). Only three of first production version, the B-52A, were built, all loaned to Boeing for flight testing. The first production B-52A differed from prototypes in having redesigned forward fuselage. The bubble canopy and tandem seating was replaced by a side-by-side arrangement and a 21 inch (53 cm) nose extension accommodated more avionics and a new 6th crew member. In the rear fuselage a tail turret with four 0.50 inch (12.7 mm) machine guns with a fire-control system, and a water injection system to augment engine power with a 360 US gallon (1,363 L) water tank was added. The aircraft also carried a 1,000 US gallon (3,785 L) external fuel tank under each wing. The tanks acted as dampeners to reduce wing flex and also kept wingtips close to the ground for ease of maintenance. The last B-52A (serial 52-0003) was modified and redesignated N B-52 A in 1959 to carry the North American X-15 at a cost of US$2 million. A pylon was fitted under the right wing between the fuselage and the inboard engines with a 6 feet x 8 feet (1.8 m x 2.4 m) section removed from the right wing flap to fit the X-15 tail. Liquid oxygen tanks were installed in the bomb bays to refuel the X-15 before launch. First flight with X-15 was on 10 March 1959, and NB-52A carried the X-15 on 59 of the program's 199 flights. Converted RB-52B to B-52B Balls 5 at Wings Museum. The B-52B was the first version to enter service with the USAF on 29 June 1955, with the 93rd Bombardment Wing at Castle AFB in California. This version included minor changes to engines and avionics, in the attempt to fix minor problems. Temporary grounding of the aircraft in February 1956, after a crash, and the following July, caused training delays, and at mid-year there were still no combat-ready B-52 crews. Of the 50 B52 Bs built, 27 were capable of carrying a reconnaissance pod as RB-52Bs (the crew was increased to eight in these aircraft). The 300 pound (136 kg) pod contained radio receivers, a combination of K-36, K-38 and T-11 cameras, and two operators on downward-firing ejection seats. The pod required only four hours to install. Seven B52 Bs were brought to B-52C standard under Project Sunflower. The NB-52B was B-52B number 52-0008 converted to an X-15 launch platform at a cost of US$2 million. It subsequently flew as the "Balls 8" in support of NASA research until 17 December 2004, making it the oldest flying B-52B. It was replaced by a modified B-52H. In the B-52C the fuel capacity (and range) was increased to 41,700 US gallons by adding larger 3000 US gallon underwing fuel tanks. The gross weight was increased by 30,000 pounds (13,605 kg) to 450,000 pounds. The belly of the aircraft was painted with antiflash white paint, which was intended to reflect thermal radiation away after a nuclear detonation. The RB-52C was the designation given, but seldom used, to B-52Cs converted for reconnaissance duties in a similar manner to RB-52Bs. The B-52D was a dedicated long-range bomber without a reconnaissance option. The Big Belly modifications allowed the B52 D to carry heavy loads of conventional bombs for carpet bombing over Vietnam. Aircraft assigned to Vietnam were painted camouflage with black bellies to defeat searchlights. In the B-52E the aircraft had an updated avionics and bombing navigational system, which was eventually debugged and included on following models. One E aircraft (number 56-0631) modified as a testbed for various B-52 systems at a cost of US$6.02 million. Redesignated NB-52E, the aircraft was fitted with canards and a Load Alleviation and Mode Stabilization system (LAMS) which reduced airframe fatigue from wind gusts during low level flight. In one test, the aircraft flew 10 knots (11.5 mph, 18.5 km/h) faster than the never exceed speed without damage because the canards eliminated 30% of vertical and 50% of horizontal vibrations caused by wind gusts. In the B-52F, the aircraft was given J57-P-43W engines with a larger capacity water injection system and new alternators. The aircraft a problem with fuel leaks, which were eventually solved by service modifications Blue Band, Hard Shell, and QuickClip. The B-52G was proposed to extend the B-52's service life during delays in the B-58 Hustler program. At first, a radical redesign was envisioned with a completely new wing and Pratt & Whitney J75 engines. This was rejected to avoid slowdowns in production, although changes were implemented. The most significant of these was the brand new "wet" wing with integral fuel tanks which considerably increased the fuel capacity  gross aircraft weight went up by 38,000 pounds (17,235 kg) compared with prior variants. In addition, a pair of 700 US gallons (2,650 L) external fuel tanks was fitted under the wings. The wing also had the traditional ailerons eliminated, instead utilizing spoilers for roll control. The tail fin was shortened by 8 feet (2.4 m), water injection system capacity was increased to 1,200 US gallons (4,540 L), and the nose radome was enlarged. The tail gunner was provided with an ejection seat and moved to the main cockpit. Dubbed the "Battle Station" concept, the offensive crew (pilot, copilot, and the two bombing navigation system operators on the lower deck) faced forward, while the defensive crew (gunner and ECM operator) on the upper deck faced aft. The B-52G entered service 13 February 1959 (a day earlier, the last B-36 was retired, making SAC an all-jet bomber force). Nearly all B-52Gs were destroyed in compliance with the Strategic Ams Reduction Treaty START I of 1992. A few examples remain in museums and as static displays at various air force bases. The B52 H had the same crew and structural changes as the B-52G. The most significant upgrade was the switch to TF33-P-3 turbofan engines which, despite the initial reliability problems (corrected by 1964 under the Hot Fan program), offered considerably better performance and fuel economy than the J57 turbojets. The ECM and avionics were updated, a new fire control system was fitted, and the rear defensive armament was changed from machine guns to a 20 mm M61 Vulcan cannon. A provision was made for four AGM-48 Skybolt ballistic missiles. First flight 10 July 1960, entered service 9 May 1961. This is the only variant still operational. A total of 744 B-52s were built. The last production aircraft, B-52H number 61-0040, left the factory on 26 October 1962. A strategic bomber is a heavy type aircraft designed to drop large amounts of ordnance onto a distant target for the purposes of debilitating an enemy's capacity to wage war. Unlike tactical bombers, which are used in the battle zone to attack troops and military equipment, strategic bombers are built to fly into an enemy's heartland to destroy strategic targets e.g. major military installations, factories and cities. 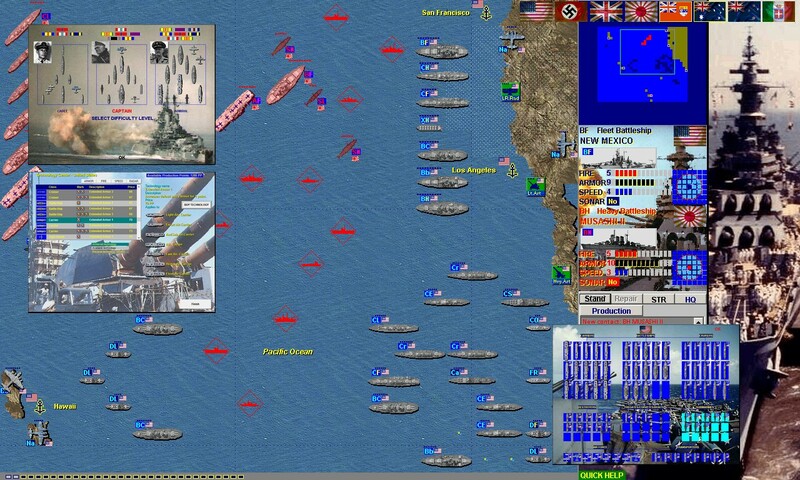 In addition to strategic bombing, strategic bombers can be used for tactical missions. Only 3 countries maintain nuclear bombers: US, Russia and China. During the Cold War the U.S. and United Kingdom on one side and the USSR on the other kept nuclear-armed strategic bombers ready to launch at a moment's notice as part of the deterrent strategy of Mutual Assured Destruction. Most strategic bombers of the two superpowers were designed to deliver nuclear weapons. For a time, B-52 Stratofortress bombers were kept in the air around the clock, orbiting fail-safe points near the Soviet border. The RAF's V-bombers were directed against targets in European Russia and would have been able to reach and destroy cities like Kiev or Moscow before US bombers. More recent strategic bombers like the Rockwell International (now Boeing) B-1B Lancer bomber, Tupolev Tu-160 Blackjack and the Northrop Grumman B-2 Spirit bomber incorporate stealth features in their design in an effort to avoid detection. Non-stealthy strategic bombers, e.g., the venerable Boeing B-52 Stratofortress or the equally venerable Tupolev Tu-95 are still relevant through the use of air-launched cruise missiles and other "stand-off" weapons like JSOW and JDAM. Indeed, it is likely that the USAF B-52 fleet will, with continuing upgrades, outlive the B-1B fleet. However, the USAF has recently launched a program for a new strategic bomber to complement the current fleet; it is likely that this bomber will also serve as a replacement for both the B-52 and B-1. In the case of the Russian VVS (Air Forces), new Tu-160 strategic bombers are expected to be delivered on a regular basis over the course of the next 10-20 years. Additionally, the current Tu-95, Tu-142, Tu-26 and Tu-160 fleet will be periodically updated, as it was seen in the 1990s with the Tu-22M fleet. During the Cold War, strategic bombers were almost certainly armed with nuclear weapons. However, since the end of the Cold War, strategic bombers have exclusively been deployed using non-nuclear, conventional weapons. During Operation Desert Storm, the invasion of Afghanistan, and the 2003 invasion of Iraq, American B-52s and B-1s were employed in both strategic and tactical roles. During the 1979-1988 Soviet-Afghan war, many Tu-95 carried out several mass bombings on several regions of the country. Six of the U.S. Air Forces B-52 bombers can now take flight with a greater variety of weapons, thanks to enhanced internal weapons bay launchers delivered by Boeing [NYSE: BA]. The upgraded launchers allow the B-52 to carry GPS-guided or smart weapons in the weapons bay for the first time and are ready for use. The upgrades to the B-52 bombers internal weapons bay have made it possible to have zero gap on the bombers long-range bombing capabilities as we transfer from Conventional Air Launched Cruise Missiles to Joint Air-to-Surface Standoff Missile  Extended Range, said Col. Tim Dickinson, B-52 Program Director with the U.S. Air Force. These deliveries follow several months of successful ground and flight testing of the launchers and support the U.S. Air Forces accelerated schedule to complete the first stage of the upgrade program  low rate initial production. The nations entire B-52 bomber fleet will soon be equipped with technology that greatly enhances the aircrafts combat capabilities in the digital battlespace. The U.S. Air Force on August 28 awarded Boeing [NYSE: BA] a contract for B-52 bomber Combat Network Communications Technology, known as CONECT. The new CONECT contract will bring capability to the entire fleet. Boeing and the Air Force worked closely under urgent deadlines to complete contract negotiations in time for upgrades to continue uninterrupted. The multifunction, critical capability that CONECT provides for the B-52 was at risk for missing kit installation schedule. Boeing and the Air Force's collaborative effort to reduce the kit contracting process by 50 percent paved the way to deliver on-time, quality war-fighting capabilities. Parallel efforts, which required early participation, communication and coordination from Boeing, sub-tier suppliers, DCAA and DCMA were key in making CONECT a success! said Renee Sauerland, B-52 CONECT project manager for the Air Force. Boeings CONECT modernizes communication systems for the B-52 bombers with enhancements that keep the bombers in flight. Each B-52 bomber comes in for program depot maintenance once every four years, and CONECT is installed at that time. We have delivered all previously contracted kits to the Air Force but needed to get additional kits on contract so upgrades could continue on every bomber that comes through  once you miss an aircraft, it is four years before you have another opportunity to touch it. Im proud of the Boeing team and thankful for our cooperative relationship with the customer that allowed us to complete negotiations so that the remainder of the fleet will receive CONECT, said Scot Oathout, B-52 program director for Boeing. The B52 bomber was built during the Cold War, but CONECT provides 21st century digital capabilities that give the bomber the agility and flexibility needed for the modern battlefield.